A few months ago, I wrote about how I attended the opening of the Skinceuticals by Project Skin, the first freestanding Skinceuticals boutique in Canada, as well as a Project Skin MD treatment centre, located at Richmond Centre in the Greater Vancouver Area in B.C., Canada. After finishing my work busy season, I finally had a chance to check out a treatment at this location, and I was definitely impressed. The treatment I received was the Max+ Light Customized Facial (C$255 for , which combines “the Customized Glow Facial with the skin balancing rewards of MAX+ LED therapeutic light. This unique treatment helps rebalance, calm, brighten and care for any skin types. Our custom light protocols boost our facial effects for acneic, rosacea-prone, aging, dehydrated, pigmented or dull skin.” The person who provided my treatment was Michelle, who has the sweetest, most calming voice, and the most incredibly beautiful skin. My treatment started with a customized facial using Skinceuticals products. Michelle started by double cleansing with a bi-phase oil remove, then a milky cleanser. After toning, she inspected my skin, and designed a treatment based on this. Then she used a physical exfoliant, followed by a 20% glycolic acid + 10% lactic acid peel. The peel was very strong, and made my skin itch and tingle, but she blew a fan on my skin to help relieve this itch. Afterwards, she applied the Clarifying Clay Mask (reviewed here) to draw out the impurities, which was followed by extractions. The extractions that she did on me were the most pain-free extractions I’ve ever had – normally extractions make me tear up but the use of the Clarifying Clay Mask really helped the blackheads surface, which made it easier for her to squeeze out. Michelle selected three serums for me. The first was the legendary C E Ferulic, which combines 15% L-Ascorbic Acid (vitamin C), 1% Alpha Tocopherol (vitamin E), and 0.5% Ferulic Acid. This is an anti-oxidant serum that Michelle recommends to use every morning right after toning and before sunscreen. Michelle says that sunscreen only blocks out 50% of the sun’s damage to the skin, and the other 50% is free radicals that are blocked by an anti-oxidant like C E Ferulic. The next serum was the Phyto Corrective Gel, which is a green gel that helps to neutralize the redness and sensitivity on my cheeks. I’ve used the Phyto Corrective Mask previously (reviewed here) and it was a fantastic hydrating mask. In place of moisturizer, Michelle used the Hydrating B5 Gel (previously reviewed here), which is a hyaluronic acid serum. She said that moisturizers don’t necessarily work the best to help your skin in the long run, whereas a hyaluronic acid serum will help to plump your skin up and maintain hydration in the long run. After the three serums were layered, Michelle started me on the Max+ Light therapy. This is a combination of blue, red, green, and yellow lights to help balance and brighten the skin. The total light therapy time was 15 minutes, and I didn’t feel any sensitivity on my skin. It was pretty soothing actually. After 15 minutes, Michelle let me look at my skin in a mirror and it was glowing! The serums definitely helped to neutralize and balance my skin, and the light therapy also helped the products penetrate into the deeper levels of my skin. Since it was during the day, Michelle finished off by applying a healthy amount of SPF 50, which will help protect my skin against the sun. I left the treatment with my skin feeling super glowy and healthy. It was my first time trying Skinceuticals products and I was pretty impressed at how simple but effective the products were. In addition, I left feeling taken care of, but not pressured to purchase anything. Michelle did recommend that I pick up the C E Ferulic, as well as the Hydrating B5 Gel. For night-time, Michelle recommended the Retexturing Activator, a serum chemical exfoliator, because my skin is a bit uneven and bumpy at the moment (I blame the heat). I felt like I was provided with good recommendations that would be beneficial for my skin, and not pushed to buy things for the sake of it. The one downside to being inside a busy mall was that you can actually hear most of the things that are happening outside your treatment room, as the sound-proofing wasn’t great. The relaxing music in the room helped to downplay the noise outside, so that was good. Plus Michelle’s voice, when she was explaining the products to me, was pretty soothing as well. The treatments here are pretty pricey. I think if I were to go again, I would probably just opt for the regular Customized Glow Facial without the Max+ Light treatment. Skinceuticals by Project Skin also offers 30 minute express treatments for $85, which is a nice treat if you are looking for a quick pick-me-up. Complimentary service received as part of the media opening celebration; all opinions are my own. Last week, I was invited to experience the ultra affordable NIC Spa in Vancouver. NIC Spa is a spa that was opened by New Image College, a training institution located in Downtown Vancouver for those aspiring makeup artists, aestheticians, and more. The people who work at the NIC Spa are fully accredited grads from New Image College, with the purpose of providing them additional experience and opportunities to grow in their careers. The NIC Spa is located on the premises of New Image College, conveniently located on Granville between Smithe and Nelson, just a few minutes from several skytrain stops. The menu at NIC Spa is super simple. 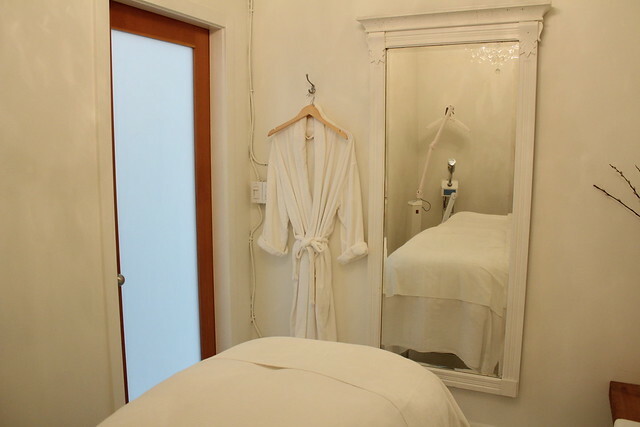 It offers facials, massages, and manicure and pedicures. The price point? $20 for each type of service. Yes you read that right, TWENTY friggin DOLLARS! I was invited to try out a facial and massage. My entire service lasted just under 2 hours, and it would have cost me around $200-300 at another spa, but at NIC Spa it would only be $40 (plus tax and tip, of course). The treatment rooms are essentially the treatment rooms used for classroom teaching, and there are a number of beds in one room, with curtains dividing each bed. When I was there, there was no one else but me in the entire room, so it was quiet and private. The multi-bed rooms actually make it perfect for when you and your friends want to indulge in a spa party. While at most other spas, this wouldn’t be possible because there’s at most 2 beds in a room, you can seriously have a great time, perhaps for your friend’s bachelorette party? My aesthetician was Doris. She started me face down for my massage first. I opted for an aromatherapy Swedish massage. Doris’s pressure was firm, and I could feel the stress relieved through my body. She definitely used copious amounts of oil to make sure that the strokes were smooth and easy on my body. After she cleansed my skin and removed my makeup, she did a skin analysis to help identify the state of my skin and the type of treatment I needed. She and I both concluded that I have dry skin (surprise, surprise), and that I needed some extra hydration. In addition to an exfoliating mask, she also used a moisturizing mask, plus plenty of facial, neck, head, and shoulder massage. While I felt like she was a tiny bit rough compared to other facial experiences I had, I was still pretty happy with it just because of the affordability, and also my skin felt pretty damn nice after I left. The most important part of a facial is how effective it is, isn’t that right? While I wouldn’t say it was the most luxurious or relaxing spa experience, it was seriously a fantastic value for just $20 for each service. I can opt to have an entire spa day, pampering my body, face, fingers, and toes, for under $100, and that’s amazing in a city where it’s becoming harder and harder to afford anything but the necessities. I’ve recommended this spa to a number of my friends, and I can see myself gathering friends to come here for spa parties as well. Services received complimentary of NIC Spa for review consideration; all opinions are my own. First time getting lash extensions from Prép Beauty Parlour! I’ve always wanted to try out lash extensions, but I never made the jump because I wasn’t sure what it would entail. Luckily, a few weeks ago, I was contacted by Prép Beauty Parlour to try out their full set of extensions. At the time, I was preparing for a work trip to Toronto, so I thought it’d be the perfect opportunity to try. Prép Beauty Parlour is the cutest beauty salon nestled on Hornby in Downtown Vancouver. It’s a two-storey salon, with the nail services done downstairs, and the lash services upstairs. The salon is beautifully decorated with mirrors and other pretty trinkets, allowing it to look bright and cheery. My lash appointment was upstairs, where there were four beds side by side each other so they can have four lash appointments at the same time. The environment was very clean. My appointment was with Christin, Eyelash Extension Master. She explained to me how the process worked – the extensions would be wrapped around my existing lashes to lift them up – and she also asked me for the type of look I wanted to achieve. She was very patient in answering all of my questions, explaining each step of the procedure as she performed them, also ensured that my eyes were very comfortable the entire time. I prefer a more doe-eyed look, so I asked for longer lashes around the centre of the eye. I also want something that’s extra curled, since my lashes were very stick straight, and I didn’t want something too long, since I wear glasses and I don’t want the lashes to touch my glasses when I blink. After an hour, my lashes were done! I was super impressed with the way I looked when I left, and due to the thickness, it also felt like I had liner on all the time, which accentuated the look of my eyes. I did have some reservations though. I felt like my right eye wasn’t as voluminous as my left eye, and the lashes on my right eye also started to fall off pretty quickly after the application. That same night, I had 3 lashes fall off my right eye, and none from my left. Due to the number of extensions in total, even though a few fell off, my eyes still looked very wide, with that doe-eyed effect. About three weeks after getting the extensions, about half of them had fallen off. The result was a wispy, wide eyed look that still looked good. My boyfriend complimented on them often! My biggest complaint at the 2-3 week mark was that because the glue was starting to get loose on a lot of them, even if I brushed them out regularly, they would still get a bit tangled, and then some of them would stab me in the eye. It was pretty uncomfortable. The other thing was, and this is a personal preference, I generally wash my face with oil-based cleansers, whether it is my oil cleanser to remove makeup, or my Bella Aura or Tata Harper cleansers that contain natural oils in them. You’re not supposed to wash your face with oil products if you have lash extensions, because the oil will dissolve the glue, so I felt like this is a bit of an inconvenience. The other thing is, I generally like to wash my face in the shower with a full blast of water, but again with lash extensions, you can’t do that because the pressure will make the extensions fall off. After all that, I would generally say that I am not the best candidate for lash extensions. That being said, though, lash extensions are pretty awesome for when you’re going on vacation and you don’t want to put the extra effort in every day to doll yourself up. My lash extensions definitely make my eyes look bigger, wider, and it generally looks nicer on photos. Lash extensions generally last around 4 weeks with proper care (they recommend fillers at the 2-3 week mark for maintenance, when there is around 50% of the lashes still intact), so they would be perfect right before your vacation. Would I recommend lash extensions? I would say no, just because most people I know wouldn’t be able to handle the upkeep. If you do want to get them, Prép Beauty Parlour is an excellent choice for salon! I received the lash extensions complimentary from Prép Beauty Parlour; all opinions are my own. This steam & body exfoliation is part of the authentic traditions of the Middle East. De-stress between a private high intensity & low mist steam chamber, the Hammam will cleanse your body while stimulating your senses and imagination. Lay relaxed on Jerusalem gold marble as you experience an invigorating full body Gommage (exfoliation) using eucalyptus infused black Moroccan soap. This experience is considered to be the ultimate detoxification treatment. Our Spa Concierge will be happy to assist you with your personalized groups of 2 or more people. Please refer to our Voyages & Retreats. It was my first time getting the Hammam and Gommage treatment. The treatment itself was fantastic, the 10-15 minute steam room treatment (the Hammam) was the most relaxing part of the experience, as I got to lie back, breathe, and relax after a very hectic week of travelling and working. The steam room was very hot, humid, but not at all stuffy, which I find is the case with most other steam rooms. I was left alone in the room, and I could have completely stripped down, but I had a sarong covering me which was more comfortable. I would have loved to stay in the steam room for longer, to detox my body of the stress and pollution during my trip to Toronto, but since I was having such a good time in the steam room, it just felt really short. The Gommage part of the treatment was also nice, but not as relaxing. I lay down pretty much completely naked (I had a disponsable thong on) on top of my sarong, while the esthetician exfoliated every inch of my body with the black Moroccan soap. My body was thoroughly exfoliated, the esthetician focused on parts of my body that I often forget to exfoliate, such as my tummy area, back of my arms, my hands, and the tops of my feet. The black Moroccan soap contained natural oils which left my body feeling smooth and hydrated. After being rinsed off and allowed to dry, I was led to the relaxation room where I was given some grapes, a pastry, and unlimited refills of chai tea. The relaxation room was very nice, dimly lit, and quiet. I would have liked to stay longer but there was a couple in the room who arrived later and who were talking in the room, and it ended up being less serene. My biggest dislike, and why this experience wasn’t as relaxing as it could have been, was that I felt like this experience was very rushed. I was rushed into the change room, rushed out, rushed into the steam room, and even the exfoliation process felt rushed. It was my first time getting this treatment, but I felt like the front staff didn’t explain what the treatment would entail. This would give me a head’s up about the different steps, and what I can expect. I feel like the Hammam and Gommage treatment would have been a great add-on to another treatment, such as a massage or facial, so it doesn’t feel like you spend so little time in the spa itself. That being said, the Miraj Hammam Spa is extremely clean, and well stocked with all the Caudalie products you can use. I had completely removed my makeup and skincare before going into the steam room, so my skin was feeling a bit naked. I topped up my skin with Caudalie products for the face, and also smothered my body in the body lotion. For the price, I don’t know if I would go back. It was a good treatment, I wasn’t blown away by my experience. If you know me, you know that I have no problem splurging for good experiences, but this one was just okay and didn’t show me enough value in terms of the level of service for me to return. The treatment provided was complimentary of Miraj Hammam Spa by Caudalie; all opinions are my own. Tata Harper is one of my favourite natural skincare brands – their cleansers are just out-of-this-world amazing. Tata’s journey started when her father was diagnosed with cancer. The doctor stated that the chemicals present in every day life played a big part in this, thus Tata set out to research and create skincare products that were natural and non-toxic. Tata Harper products are created in a vertically integrated manufacturing and distribution plant located in Vermont, which also houses a farm where much of the ingredients are grown. Her products are certified organic, all natural, and most of the products are vegan, with the exception of certain products that contain beeswax and honey, and also cruelty-free. As my biggest skin concerns are hyperpigmentation and dehydration. I received the brightening facial at Collective Skin Care. My facial started with the incredibly luxurious Nourishing Oil Cleanser, this is one of the richest oil cleansers I’ve ever used, and it’s also extremely hydrating and nourishing. It contains Beta Carotene, Vitamins A, C, E, Lycopene and Omega 3 to soften and improve skin texture. It removed all of my makeup, and prepped my skin for the Purifying Cleanser, a cleanser containing enzymes, designed to gently loosen dead skin cells, deep cleanse the pores, and release toxins and pollutants from the skin. Next came exfoliation using Tata Harper’s award winning Regenerating Cleanser, which also happens to be my favourite Tata Harper product. I’ve reviewed the Regenerating Cleanser extensively here, so check it out. One interesting thing to note was that all three cleansers were applied to dry skin, which allowed maximum product penetration and efficacy since the skin is not shielded by water. I felt that using the Regenerating Cleanser dry felt a bit rough on the skin, but I didn’t notice any long term sensitivity. After triple cleansing and exfoliating, I got to try out the new Purifying Mask. This clay-based mask was designed to deep cleanse the skin and extract any toxins that were buried deep within the pores. It is also filled with natural pressed oils to help hydrate and nourish the skin. Clay is generally a very drying skincare ingredient, but when mixed with plant extracts and oils, it will replenish any dryness with moisture. 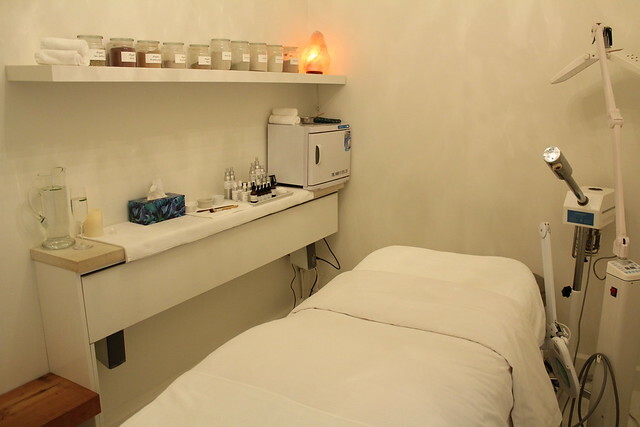 After removing the mask, it was followed by a face, neck, and decollete massage with their Beautifying Facial Oil. The oil was removed with the Refreshing Cleanser, which contains pomegranate enzymes, grapefruit and bergamot, french pink clay, and willow bark, which come together to gently cleanse the skin. The Resurfacing Mask, one of Tata Harper’s most popular products, was layered directly on top of the cleanser to create a concentrated enzyme mask, with double the brightening and exfoliating powers. I have the Resurfacing Mask and I’m kind of on the fence about it, which is why I haven’t done a review of it yet. I just felt like it hasn’t done much to my skin on its own, but together with the Refreshing Cleanser, there is mild stinging which feels like the enzymes are doing their jobs. The key to this brightening facial was the incorporation of the Concentrated Brightening Essence, applied to the face blended with the Concentrated Brightening Serum. It is rare for a natural skincare line to have brightening products because most products on the market contain chemicals to reduce hyperpigmentation and even out the skintone. However, Tata Harper’s brightening products include ingredients such as sea kelp, milk thistle, enzymes, and willow bark extract to gently yet effectively exfoliate the skin, reduce the look of spots, and also prevent new spots from producing. My facial finished off with a generous dose of the Repairative Moisturizer. This moisturizer, designed for dry or mature skin types, contains mango seed butter, jojoba seed oil, and raw honey sourced from a neighbouring farm in Vermont. I actually love this moisturizer so much that I went and bought a full sized version – I’m completely in love with honey in my skincare right now, so just the mention of that made me jump on it. After my facial, I’ve noticed that my skin texture has improved significantly – it is definitely brighter, more refined, smoother, and much softer than it was before. My pores have been deep cleansed, and much of my blackheads have disappeared. The only downside I can think of is that Tata Harper doesn’t have any products that contain sunscreen, so when I left the facial, I was walking outside on a sunny day with no sunscreen on. 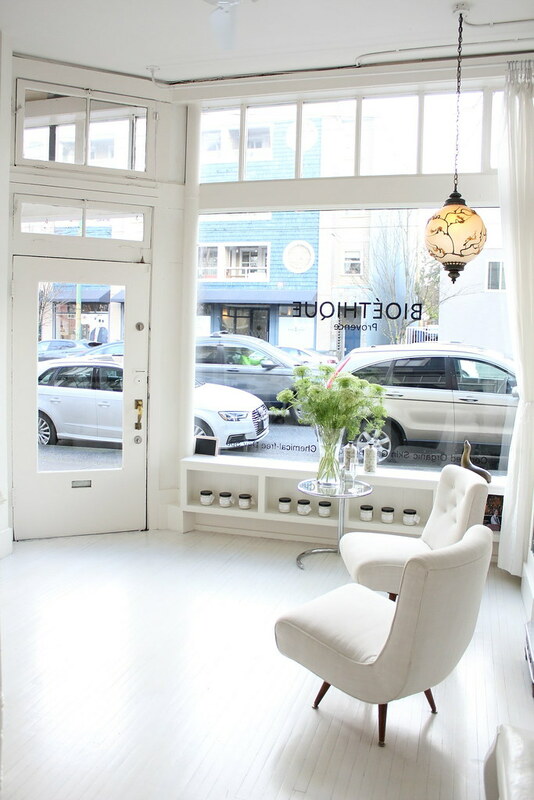 Collective Skin Care in Yaletown offers Tata Harper facials, and while the prices are a bit higher than what I’ve been used to for facials, you will arrive and leave with confidence that the products being used are the very best of the best. I highly recommend the Brightening Facial, especially if your skin is going through a change of season, or if you are preparing for a special event that requires you to look your best. This is a great way to give yourself a skin “reset,” even if you are already using Tata Harper products in your regular routine. Now here’s a photo with me post-facial with no makeup on. What do you think? A few weeks ago, I was invited to experience the new Dermalogica IonActive Power Treatment Facial at the International Dermal Institute in Vancouver. My treatment was handled by Cory, Senior Dermalogica Trainer, who is extremely knowledgeable about skin treatment, as well as Dermalogica products. The new IonActive Power Treatment is a 45 minute professional treatment that is designed to treat skin conditions such as acne, dehydration, hyper pigmentation, sensitivity, and aging. The key parts to the IonActive Power Treatment are the IonActive serums and the Gelloid masks. There are four IonActive serums specifically designed for treating particular skin concerns, and they are used in conjunction with a tool that delivers microcurrents into the skin, which allows for deeper penetration of the serum ingredients. There are also two types of Gelloid masks. These masks are used both as a massage cream, as well as a face mask. The facial massage was specifically designed to help push the IonActive serums further into the skin for better penetration and efficacy of the serum ingredients. EndoThermal Gelloid – a cooling massage mask that is perfect for soothing sensitivity, reducing inflammation and suppressing acne. Based on your Face Mapping analysis, as well as your own description of your top skin concerns, you were prescribed a treatment. My main skin concerns are hyper pigmentation and dehydration, and Cory agreed based on an analysis of my skin. As such, he recommended the Oligopeptide IonActive in conjunction with the ExoThermal Gelloid. He started the treatment with a deep cleanse of my skin using the Pre-Cleanse, an oil cleanser and one of my favourite products from Dermalogica. He then double cleansed with the Ultra Calming Cleanser, a gel-based cleanser that’s very soothing, gentle, yet effective. The cleanser was immediately followed a deep yet gentle exfoliation using the Daily Microfoliant. After what was pretty much a triple cleanse, Cory walked me through the different types of IonActive serums, and we both agreed that the Oligopeptide serum was the best for me as I wanted to focus on reducing my hyperpigmentation. The Oligopeptide IonActive serum was applied generously over my face with a spatula. The serum was left to set for a minute, and then the Gelloid mask was applied. I have stressed and dehydrated skin so the ExoThermal Gelloid was used for the facial massage. The facial massage was extremely relaxing, and probably my favourite portion of the facial. After 10 minutes, the mask was removed using a warm towel, and the facial ended with a quick spritz of the Multi-Active Toner, and a generous application of the Pure Light Day Cream, which contains SPF 50, to get me ready for the rest of my day. My skin, upon leaving the IonActive Power Facial was extremely supple, hydrated, and brightened. Of course it was just one treatment so I didn’t see any huge improvements (it’s just a facial, not magic). For maximum benefits, Dermalogica recommends a series of three to six treatments initially (every two to four weeks), and then followed by maintenance treatments twice a year. The Dermalogica IonActive Power Treatment Facial is available now at select skincare centres and spas across Canada for a suggested price of $120 per session (varied by skincare centre). I was invited by local Vancouver beauty boutique Beauty Court to experience a Babor express beauty treatment during their recent Babor beauty event. I have a long history with Beauty Court, first shopping with them at the young age of just 15. I purchased my first ever Anna Sui products from them, which also ignited my love for the brand. Thus when they wanted to collaborate with me, I was simply over the moon! Beauty Court specializes in specialty luxury skincare, importing high end skin care brands such as Valmont, Guinot, Cellcosmet, Babor (one of their more recent additions to the brand roster), and are the exclusive B.C. seller of Swiss skincare brand, Swiss Line. Beauty Court also carries luxury beauty brands such as Guerlain, Cle de Peau, Shiseido, Dermalogica, Clarins, Anna Sui and Paul & Joe. 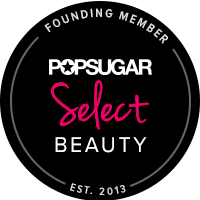 They are family-owned and operated, and are equally passionate about beauty products are they are their customers. Beauty Court has a spa section for doing facials, massages, and other treatments on their customers. This spa side is simply gorgeous – probably one of the cleanest and most serene spa spaces I’ve ever been in. My treatment room was a good size, not claustrophobic like other treatment rooms I’ve been in, and there is a spacious bathroom (with shower) connected to the treatment room so I can use it at my leisure without walking around and seeing other customers – the perfect design to create the ultimate relaxation experience. 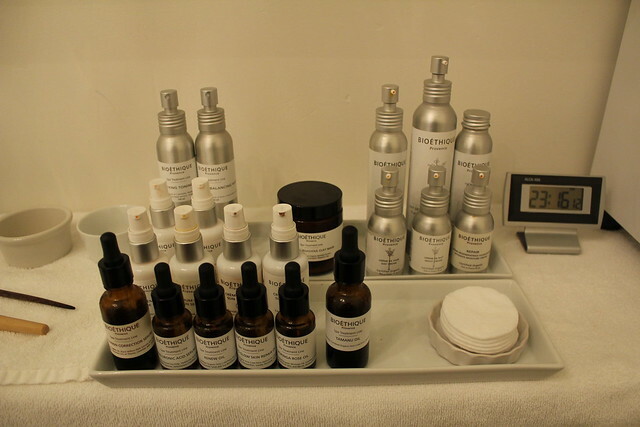 They use the luxury skincare products available on their retail side for their spa services. I had previously written about Babor, but just as a refresher, Babor is a Germany innovative skincare brand with a strong focus on research and development. Founded exactly 60 years ago in 1956, they were the inventor of the ampoule, a concentrate skin treatment serum encased in individual-use glass vials for the freshest, most hygenic product. My esthetician first removed my makeup, then deep cleansed with a mixture of the HY-OL with the Phytoactive Combination. The HY-OL is a cleansing oil that contains soybean, sesame and peanut oils, as well as quillaja extract, and the Phytoactive Combination is an herbal cleansing extract for use with the HY-OL, which contains the detoxifying extract of Agrimonia eupatoria, which has an astringent effect, as well as the essences of sage, witch hazel and azulene to refine and balance the skin. The cleansing portion was so relaxing and I felt like my skin was deep cleansed, refreshed, but still hydrated at the same time. My esthetician then designed a routine with other Babor products that suited my skin, which included a serum, a 5 minute facial massage, a 10 minute face mask (with neck and shoulder massage), eye cream, face cream, and ultimately sun screen, which a lot of facial places forget to apply. I’m not new to facials as I’ve reviewed a number of them on the blog, but this was the first time I’ve ever gotten an Asian-style facial. What’s the difference, you ask? Asian-style facials focus a lot more on massaging the different pressure points on your skin to help revitalize your skin through increased blood flow, and also lift up the skin. My facial was an express 45 minute one, whereas the normal facials are 1.5-2 hours long, which means there is a lot of massage time in there. Not only did my esthetician massage my face, but also focused on my neck, shoulder and upper arms. I left feeling super recharged and relaxed, which was exactly what I needed after a long week of work. Last thing I want to mention is that I left Beauty Court with exactly the right amount of product, i.e., moisturized and sunscreen, on my skin, which has almost never happened to me before after a facial. There were times where I left facials with too much cream or sunscreen on my face that it was sticky, heavy, and just felt bad. There were other times where not enough cream was applied so I left the facial feeling drier than before I had gotten the facial. By contrast, my skin felt very hydrated, plumped, brightened, and comfortable after my session with Beauty Court. Because of this, as well as the quality of the service and amenities, I have to say this is one of the best facials I’ve ever gotten in my life. I received a few Babor products to try at home, so I’ll be reporting back on those in a few weeks. I do have to say that I woke up the day after my facial with incredibly soft, supple and bouncy skin, so I look forward to seeing what long term use of Babor products will do to help with my skin! Make sure to check out Beauty Court if you’re in the area, they also offer online shopping at beauty-court.com.